Spacious 2 bedroom, 2 full bathroom condo situated at a short walk to the beach, restaurants, supermarkets and all amenities. Building A, 2nd Floor, Walk Up. This elegant and spacious second floor 2 Bedroom 2 bathroom condo of 1,237 sq. ft. is well equipped with everything you’ll need to enjoy a relaxing vacation. A great floor plan consisting of a living room with large open kitchen with stainless steel appliances with microwave and water cooler, dining area that seats 6, master bedroom with King bed and en-suite bathroom and walk-in closet, 2nd bedroom with Queen bed, a separate laundry room with washer and dryer, large terrace, central air, ceiling fans, Cable TV FREE Wi-Fi, and 24/7 security. Sleeps 6 including Queen Sofa bed in the living room. Large swimming pool with sun deck. There are 3 LCD HDTV’s in the condo. One 32” in the living room and a 22” in each bedroom. Safe in the unit. Free private parking. Palm Suites is ideally located (4 to 5 minute walk) from the beautiful white sandy Bavaro Beaches. 9 minute walk from the El Dorado Plaza and Plaza Turquesa where you will find 2 grocery stores, bakeries, pharmacy, a currency exchange office, ATM, 2 bars, hairdresser, beauty salon, restaurants, boutique, Gym, Casinos etc. Short 5 minute drive to the Palma Real Shopping center and Movie Theaters and a 10 minute drive to the new San Juan Shopping center with 32,000 sq. ft. supermarket, 60 boutiques and 7 movie screens. 20 minute drive from the Punta Cana International Airport (PUJ) and at a 5 to 30 minute drive to 12 different golf courses. •	The Dominican Republic is a developing country and it has it's challenges in regards to cost effective electricity distribution. Therefore, to encourage renters to conserve electricity during their stay, they will be responsible for electricity charges during their stay. Also, this allows us to offer lower rates since we do not have to include more $$$ per night to take electricity consumption into consideration. •	Normal consumption is $5-10 per day for a 1 & 2 bedroom, $10-$15 per day for a 3 & 4 bedroom and $25-$30 for Villas in Cocotal Golf. RENTALS LESS THAN 30 DAYS: We require an ELECTRICITY DEPOSIT (CASH ONLY-UPON ARRIVAL) of US$20 PER NIGHT for 1 & 2 BDR's CONDOS, US$30 PER NIGHT for 3 & 4 BDR's CONDOS and US$50 PER NIGHT for VILLAS in COCOTAL GOLF. The family and I spent eight days at Palms Suites,Punta Cana DR. We found the accomodations very clean and comfortable. The check-in and out was handled proffessionally. Security was satisfactory. The neighbors were diciplined and friendly. Pulic transportation was very close and most stores within walking distance. The public beach has dining available and excursions. We would definitely would return there. Clean, classy apt with terrific backup from the agents. Great service from GoPuntaCana realtors!! The apt had everything we needed plus it was clean and quiet. Pool and parking and 24 hr security. Again, the staff of GPC Realtors were exceptional. Extremely impressed with the rental. The apartment had two full bedrooms and bathrooms, three working tvs, full kitchen appliances, and laundry room. The bathrooms were stocked with towels, and they even provided additional beach towels to use. The kitchen was stocked with lots of pots, pans, plates and anything else we could need. There was also a beautiful patio with a table and chairs. The apartment was in extremely great condition. The apartment complex is a short walk to the beach. There are several grocery stores and restaurants within walking distance. The staff was helpful in the check in and check out, and there is always a staff member at the front gate to assist if needed. 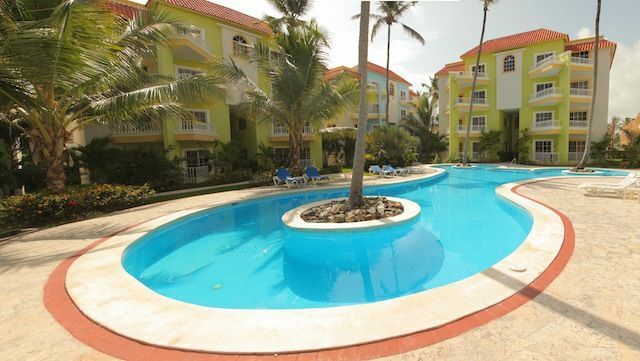 It was a wonderful experience staying here, and would highly recommend this location for anyone who is interested in a safe, quiet, clean, centrally located apartment near Bavaro Beach. The condo was beyond our expectations ,it was very clean and well equipped with everything we needed. The location was as promised,short walk to the beach,we felt very safe and comfortable The management person was very helpful and very professional,and she went out of her way to answer all of our questions. Det var en god oplevelse og noget vi ville kunne anbefale til andre. El Cortecito Beach and Los Corales, in the heart of Bavaro, is the closest to a small beach town/fisherman village in the area. This area is considered to be the downtown of Bavaro-Punta Cana. You will find restaurants, bars, pharmacies, supermarkets, shopping centers, gift shops and banks. This is one of the last established beach front communities within the 35 km stretch of white sand and turqouise colored beaches.